This essay was first published in Sidney Littlefield Kasfir and Till Förster, African Art and Agency in the Workshop (Bloomington: University of Indiana Press, 2013). It is republished in FIELD with the author’s consent. On a sunny day in northern Mozambique in 1973, the British journalist Iain Christie interviewed Samora Machel, the political and military commander of FRELIMO, or the Mozambican Liberation Front, and future president of Mozambique. 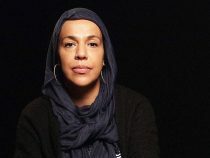 Christie had come to the northern province of Cabo Delgado to write about FRELIMO’s “liberated zones,” areas where the political movement’s armed rebellion had largely pushed out the Portuguese and established autonomous territories in anticipation of eventual national liberation. A declared Marxist-Leninist vanguard party, FRELIMO intellectuals in Tanzania had early on adopted socialism as an alternative to both the capitalist colonialism of the Portuguese overseas empire and what it termed the “feudal tribalism” of pre-colonial societies. When war broke out in 1964, Machel and the party leadership sought to erect a new society within its liberated zones based in a materialist dialectic of class struggle and collective production. In a photograph of the two men taken during the interview, Machel holds forth as Christie scribbles away in his notebook. [fig. 1] The force and animation of Machel’s remarks are evident from his blurred hand and finger, but it is a second pointing finger – that of a crouching soldier to his right – which directs us to the subject of his remarks: the small collection of dark wooden figures on display in the foreground. These sculptures are blackwood carvings, a genre of small-scale figural sculpture developed in the colonial era by Mozambican Makonde  artists to sell to Europeans throughout Kenya, Tanzania, and Mozambique. Why would Machel discuss Makonde blackwood sculpture with a reporter ostensibly interested in the social and political aspects of FRELIMO’s liberated zones, and what are these art works, originally created as souvenirs and exotica for tourists, doing in a militarized area to which such patrons had no access? We can begin to answer these questions by taking a closer look at the figures themselves. On the far right, a sipal, or native Mozambican police officer identifiable by his iconic fez, drives a bound prisoner and a female porter ahead of him with a baton. The central composition depicts another sipal in the process of tying a captive’s arms behind his back. To the left, and cut off by the frame of the photograph, two men carry what is most likely a palanquin bearing a Portuguese colonist. These modest sculptures convey the abuses of the colonial state, and as such were meant for an audience very different from the European residents of East African urban centers and administrative posts. This single photograph provides powerful evidence of a radical shift in the content and meaning of blackwood sculpture. As it developed its political philosophy and sought support from international allies FRELIMO realigned the medium for distinctly different purposes, conceptualizing blackwood carving as a primary symbol of its socialist project in Mozambique. In blackwood sculpture, FRELIMO saw an extant example of workshop-based artistic creation that conformed to its own ideologically-derived model of collective and cooperative production. The party sought to marry this practice to a nationalistic content based in images of imperial exploitation and African heroism which, it argued, emerged naturally from artists and processes of artistic production that were embedded in socialist praxis. The art ultimately produced through this intersection of collective production and party patronage would conform to FRELIMO’s concept of a distinctly socialist aesthetics, a Mozambican analogue to the “socialist realism” of other socialist states. The forms, practices, and ideals pioneered in blackwood production would ultimately influence the works of other artists in post-colonial socialist Mozambique. The colonial market for Makonde carvings developed in the 1930s as Portugal consolidated its control over northern Mozambique. Local artists adopted the media of ivory and ebony and carved small ethnographic busts, tropical animals, and even chess sets to conform to the tastes and values of their European patrons. The great demand for what became known as “modern Makonde sculpture” throughout Mozambique, and especially in the colonial capital of Laurenço Marques, now Maputo, is evident from the attention it received in colonial intellectual circles at this time. Numerous articles on Makonde blackwood sculpture were published throughout the 1930s and 1940s in Portuguese periodicals such as Moçambique Trimestral Documentário, which sometimes left a secondary colonial imprint upon the medium by reproducing examples as abstracted cartouches and insets reminiscent of the popular Art Deco style found throughout the cosmopolitan capital. The first public museum exhibition dedicated to the genre was organized in 1949. The integration of Makonde sculpture into the colonial economy, and the increasing necessity for more organized structures of its production and distribution, promoted a significant shift in the practice of sculpture and the status of the artist in Mozambican Makonde society. Prior to the popularization of blackwood carving, Mozambican Makonde artists primarily produced wooden masks for mapiko, men’s masquerade performances. While Makonde mask sculptors were — and still are — recognized as masters (vapundi, sing. pundi) of their art, however, within Makonde communities they were considered something akin to amateur enthusiasts rather than “professionals.” Mask carving was largely rejected as a legitimate economic pursuit, and those who devoted too much time to making masks were thought to be somewhat lazy, self-indulgent, and neglectful of their other responsibilities. In the same vein, extensive instruction in mask carving – while enjoyable and interesting – was considered a poor use of time and resources, and this attitude precluded the possibility of the development of a formalized education system in sculpture of this nature. Most aspiring carvers therefore pursued their training in an ad hoc manner, observing other sculptors when opportunities arise and working out technical questions largely on their own through trial and error. The absence of apprenticeship or other formalized training structures meant that most Mozambican Makonde mask carvers were autodidacts who worked in isolation from other carvers. Mapiko masks, as a result, were understood by their makers to be pure expressions of innate creativity, uninfluenced by the work of other artists. By contrast, the very real rewards of the commercial sculpture market promoted a professionalization of the artist and the development of formalized and collective structures of artistic training and production, leading to a unification of style and subject matter. The incentives promoting these developments were considerable: blackwood sculpture provided a point of entry into the new money economy, allowing artists to pay taxes and claim gainful employment and avoid the onerous forced labor into which most Makonde men and women were drafted. Many carvers also managed to utilize their associations with powerful patrons – either colonial administrators or the Catholic Montfortian missionaries who operated independently of the government – as shields against abusive colonial police and other representatives of the state. Carving for the colonial market thus emerged as an increasingly popular economic pursuit among Makonde men. Early pioneers of the most commercially successful art forms established workshops in which they apprenticed younger artists seeking entry into the market. Master sculptors offered their students instruction and the use of tools and materials in return for a share of the profits from the works they created. Blackwood sculpture is largely known in the West because of the genre’s development in Tanganyika, to the north. Thousands of Makonde men had left Mozambique for British East Africa to escape the increasingly coercive Portuguese efforts to squeeze labor and agricultural profits out of their overseas colonies. While most worked on plantations that supplied the booming sisal industry, many also saw opportunities for sculptural work and formed new workshops with other Mozambican Makonde carvers. Other scholars have published historical and theoretical examinations of the artists, patrons, and sub-genres that emerged in this context such as the well-known shetani style. The focus of this article is on blackwood’s, and its practitioners’, evolving relationship with the Mozambican nationalist movement, FRELIMO, which coalesced as a national political party in the same time period. Mozambicans’ shared sense of exile, coupled with their integration into the politically organized labor force as members of the Tanganyikan African National Union, or TANU, not only cultivated a stronger sense of national identity but also opened their eyes to the political and economic advantages derived from collective action. The most significant outgrowths of this experience, from the perspective of FRELIMO’s organizational and ideological evolution, were sculptural and agricultural cooperatives. Indeed, many of these associations’ members would later comprised the earliest core leadership of the FRELIMO party. Constantino Mpakulo, a Mozambican Makonde producing blackwood sculpture in Dar es Salaam in the 1950s and 1960s, became a FRELIMO organizer among his fellow Makonde artists and was instrumental in creating the Manamba sculptural cooperative. Because he was literate, he served as the cooperative’s secretary and was later integrated into the party’s military command. 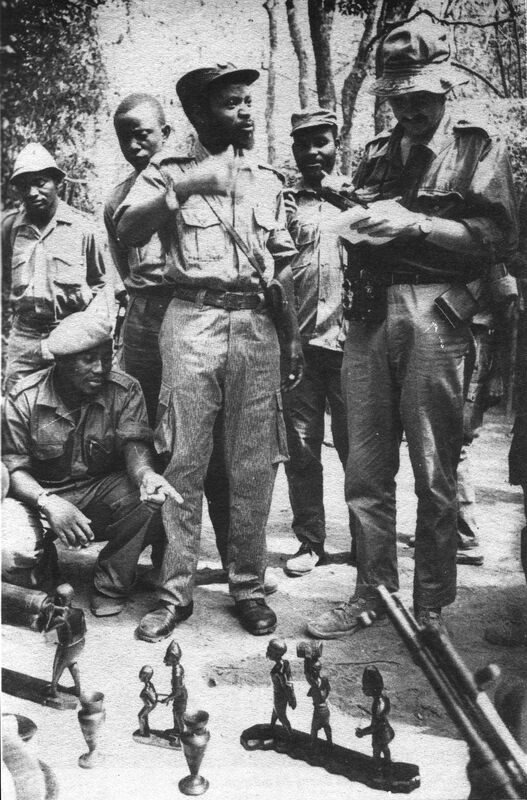 The war for Mozambican independence was launched on September 25, 1964 with a surprise attack against the administrative post of Chai in northern Mozambique. Soon thereafter, FRELIMO ordered local populations to move closer to FRELIMO bases and away from potential points of armed conflict. The relocation and concentration of civilian communities into the liberated zones fostered a dynamic of mutual reliance between military and civilian populations, each offering the other aid and protection in support of the shared goal of liberation. In light of life in the liberated zones, FRELIMO’s later claims to a homegrown Marxism developed in response to wartime necessities are not inaccurate. Under FRELIMO direction, party representatives developed agricultural and industrial strategies meant to feed and equip both soldier and civilian. FRELIMO managed cooperative fields and encouraged the organization of agricultural collectives whose participants sold their produce to the party at a fixed rate. Transported to FRELIMO storehouses in Tanzania, these crops were then sold to fund the war or redistributed to soldiers. Another economic sector slated for development was the blackwood sculpture industry, which the party recognized as a potential source of revenue and visual communication that could advance the struggle for independence. FRELIMO’s evolving ideological line, however, considered Mozambican artists and the art works they created within the context of colonial capitalism to be highly problematic. The role of the artist as well as the content and structure of his or her creative production would have to be redefined for it to function productively within the socialist context then unfolding in northern Mozambique. 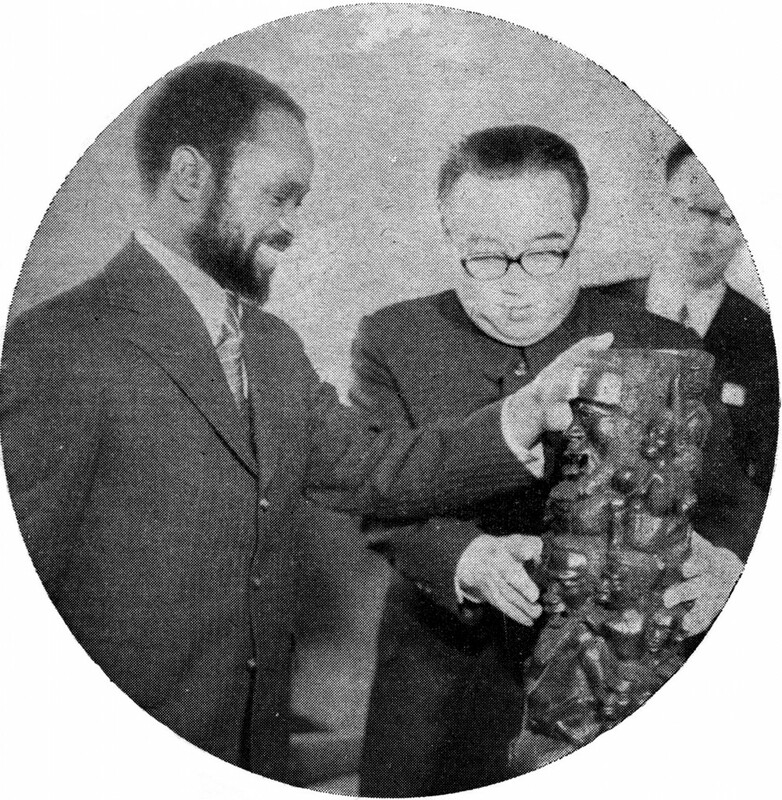 In 1970 FRELIMO Politburo members Armando Guebuza and Sérgio Vieira articulated the case against the colonial artist most comprehensively in an address to a UNESCO conference in Dar es Salaam entitled, “The Influence of Colonialism on the Artist, his Milieu and his Public in Developing Countries.” Art in capitalist societies, they argued, was commercialized and beholden to the bourgeoisie. Unsurprisingly, artists had out of necessity allied themselves with the interests of this socio-economic stratum and were therefore denied opportunities to create works that questioned the dominant class structure. The effects of this were pernicious: the artist was isolated from the masses, his position elevated to a particular professional class; the culture of bourgeois individualism and economic competition pitted artists against one another and discouraged class awareness; finally, class consciousness had been scrubbed from the artistic repertoire, promoting a socially valueless “art for art’s sake” – formal exercises with no meaning beyond the elite and solipsistic discourse of art itself. Because our people were always resistant to this colonial oppression, those who would continue with [artistic] work were given other types of punishment: they made us execute Portuguese figures, copy figures from religion that had nothing to do with the existing religious mythology … when [the Portuguese] felt the force of art in Cabo Delgado, they tried to destroy it by turning the artists into copiers of all things Portuguese (figures of [Luís de] Camões and other Portuguese writers, etc). The psychological effects of this creative censorship could be perceived in the vapid and vacuous works these artists produced: “The style reflects an incapable creative attitude, indicating the most insidious repression of protest or confrontation; a spirit of overwhelming resignation.” This state was exactly the “colonization of the mind” that Samora Machel invoked in countless speeches and pamphlets in the years following Mozambican independence. Because our art is revolutionary, it both dies and is born in praxis. Our theater, our music, our songs, our sculpture, our painting, our literature, is all forged with the active participation of the masses, without the distortion created by the contradiction between the public as object and the creator as subject …. This possibility of solving the contradiction between an object public and a creative public starts with the artist joining the political formation which is leading the people to transform society, or at least with the artist seeing his activity as a task and this task being bound up with the revolutionary process of transformation. This does not mean that the Party directs the artist administratively. Quite the contrary, the Party provides the basic ideological definition without which the artist would isolate himself in aesthetics, removed from the peoples’ problems and their concrete struggle. The authenticity of the artist is then to be found in the coherence between his creative work and his life, his integration with the masses. Art comes from the working people. The Artist is the son of the People and it is from them that he drinks his inspiration; he must not turn away from their preoccupations. In consequence the work has a social finality that is educational, that is political and Historical. In the present phase Art must constitute a weapon in the class struggle and an instrument in the construction of a New Society. The arts must lose their exclusive character of decorative function for the delight of the tiny privileged minorities and must reinstate the social Function that is proper to them. While there was broad consensus on the role art should take in socialist society, the matter of what kind of art should be promoted, and how that art should be produced, were still subjects of debate. The 1977 conference on culture quoted from above concluded with a series of recommendations: that monuments be constructed “to great moments in history;” that murals be painted “translating scenes from the life of the country or the struggle of the Mozambican workers in constructing a new society;” and that bronze and marble be employed “to produce in enormous scale the beautiful sculptures of popular origin that at this moment are being collected in museums and private homes.” Dissenters, however, argued convincingly that this idea of socialist art did not truly democratize the artistic process. Even if the artist was “the son of the masses,” he or she still remained a distinct entity defined by a unique occupation and place in society. Additionally, the materials and tools required to create this type of art – bronze and marble, oil paints, brushes and chisels – were available only to the lucky few who could afford them and had been trained to use them. It was therefore impossible to achieve a truly socialist and revolutionary art through these media and techniques. What can be done here to ‘democratize’ painting? It is easy for us to imagine some artists who interiorize the experiences of an ideological nature imposed through our revolution. They will certainly succeed in making works of art for the masses, “for all.” How many artists will there be? Half a dozen, a dozen? How many are there of us Mozambicans? Around ten million. If a dozen artists make paintings with a revolutionary theme, will we achieve cultural democratization? Clearly not. But must ten million Mozambicans produce revolutionary paintings so that we can glorify our culture in democratized terms? Clearly not! This would be absurd and impractical. The problems then, were two-fold: what is “art” and who is an “artist” in socialist society? To some extent, each defined the other. To cultivate the artistic potential within all of its citizens, to make each one of them an “artist” in his or her own right, FRELIMO would first need to create conditions in which everyone had equal access to modes of artistic production and, simultaneously, expand the notion of “art” itself to include the types of products that they could actually, and often already did, create. For us, art is within reach of everyone: any individual is an artist. An Artist is he who has the capacity to correctly utilize the possibilities of the material. Thus, we observe daily the creation (and our utilization) of works of art, such as the chairs we sit in, the cutlery we eat with, the roads on which we travel, the automobiles, etc. Artist versus artisan: the difference in terminology is revealing. In FRELIMO’s rhetoric, the artist saw himself as a discrete agent detached from society, whereas an artisan was an implicit part of its machinery. An artisan participated in the praxis of socialism, and through his participation reinforced socialism itself. FRELIMO’s program for the development of blackwood cooperatives, in which the party proposed to reorganize the terms of blackwood sculpture to fit a model of socialist production and guide its content to reflect the revolutionary consciousness it hoped to cultivate among the people, anticipated the terms of this later debate and influenced the ideas that drove it. In December 1966, the military organized sixty-two Makonde guerillas who had been blackwood sculptors during the colonial era into a sculptural cooperative. It also encouraged civilians who sculpted, or who were interested in learning the trade, to collectivize as well. 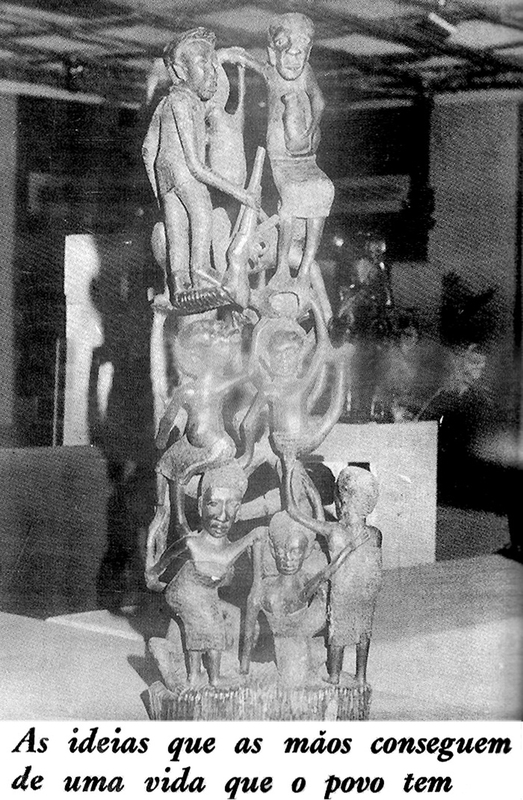 Under the plan organized by the provincial secretary of Cabo Delgado, civilian sculptors affiliated with cooperatives were required to fill a personal quota of twenty sculptures, which was then combined with the work of other members and transported to the Beira military base in Nangade, where FRELIMO representatives paid a lump sum for the goods. This money was reinvested in tools, transportation, and materials, and the remainder was distributed equally as profits among the members. FRELIMO transported the works across the border to Mtwara in Tanzania and sold them to Tanzanian entrepreneurs at a profit to support the war effort. I personally sculpted busts of Lenin, Mao, Julius Nyerere, and Eduardo Mondlane. These weren’t sold, but given to visitors … All art works that showed the action of war or the suffering of the people were meant for the nations and organizations that supported the struggle for liberation. The sculptors are organized in cooperatives that operate in relation either to the military bases for sculptors who are members of the Liberation Army, or to the village committees. Both these forms of organization and the new social framework out of which they have grown are reflected in the content of artistic work which, together with traditional subjects, now depicts the new themes inspired by the revolutionary war. In this context, the form of expression, because it goes with an authentic content, takes on its true significance as a means of communicating sensitivity. The form becomes a kind of soft and fresh skin covering a harmonious body. All attempts at aestheticism only result in rendering this skin a flabby, empty, repulsive object. … the art of the Popular Democracy must be an instrument of criticism and self-criticism. As an instrument of combat and education of the great masses, art must adopt socialist realism as its creative method – the true representation of reality. To reflect upon reality, with veracity; to reflect reality, with veracity. As a form of visual propaganda socialist realism was conceived as a reflexive mirror of society, one that employed a critical naturalism to reveal the strengths and weaknesses of the people and provide them with ideologically derived models to emulate. Mimetic representation, as opposed to the more obscure formal conceits of abstraction (Guebuza and Vieira’s “aestheticism”), provided the most direct and immediate means of communicating a given position to an unsophisticated public. The state’s ideological line would be more readily absorbed by viewers who recognized themselves – or, more likely, better versions of themselves to which they should aspire – in the image. Posters produced and disseminated after independence by FRELIMO’s Department of Information are perhaps the most straightforward examples of the aesthetics of socialist realism propounded by the state. 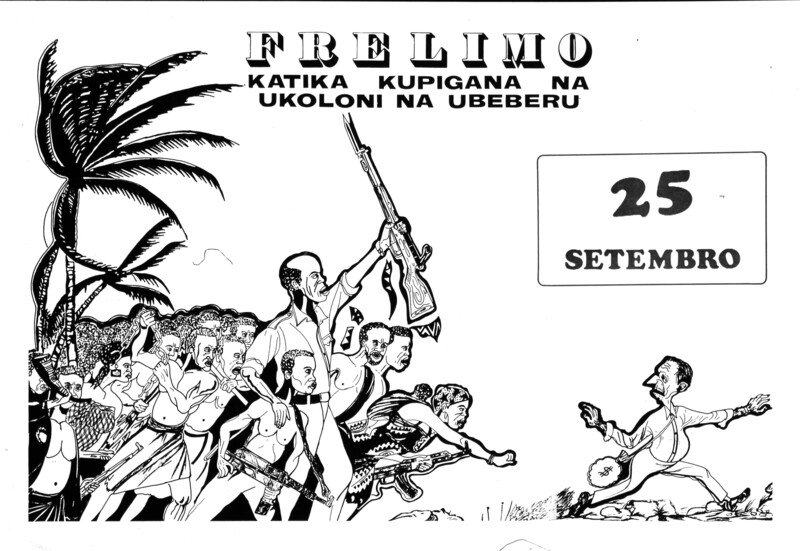 FRELIMO: KATIKA KUPIGANA NA UKOLONI NA UBEBERU … 25 SETEMBRO (FRELIMO: The fight with colonialism and imperialism has ended … September 25), which dates to 1975 and denotes the day that Mozambique attained its independence from Portugal, is typical of early Mozambican socialist realism. [fig. 3] Written in Swahili, it probably originated within FRELIMO’s Tanzanian party headquarters and disseminated in northern Mozambique as well as among the large Mozambican Makonde refugee populations living in southern Tanzania at that time. The late FRELIMO party president Eduardo Mondlane, brandishing a rifle and recognizable by his receding hairline, leads a crowd of his fellow Mozambicans — including bare-chested men dressed in hip cloths representing village elders; urban Mozambicans; and male and female soldiers brandishing Kalashnikovs – in driving out a dwarfish, large-nosed colonialist with a bag of money marked with a dollar sign. The diversity of the crowd speaks to the party’s inclusive view of Mozambique, which held that all members of society must participate in vanquishing the enemy, while the presence of village elders speaks to the FRELIMO’s political rhetoric of a homegrown socialism born from practical solutions based in local history and cultural knowledge. [FRELIMO Provincial Secretary] Raimundo Pachinuapa said that the first thing to eliminate, because there was no time for it and because it made no sense, was tattoos. Did you hear it? (“Yes!”) … The conference decided that tattoos mustn’t be an identification of an ethnic group. A Makonde must be equal to a Shangana from Gaza, to a Makua from Nampula, a Ronga from Maputo … The second action that they proposed was the elimination of the practice of tooth filing. The elders and all the participants agreed: “Yes, let’s end this, this is obsolete.” Now look at the new generations, look at the youths who were born during the war for national liberation! They are free from tattoos and filed teeth! The third action was to stop with the practice of mutilating the lips of our women. (“Applause”) All these victories constructed National Unity. You sacrificed your traditions, your culture, in favor of National Unity. “Tribal” marks had become a metaphor for colonial exploitation with the colony’s circles of urbane nationalists well before the onset of the war and FRELIMO adapted this rhetorical turn for the rural masses. Ethnic tattoos were linked conceptually to the scars left by Portuguese whips and the general violence the colonial administration inflicted upon the indigenous Mozambican people; both were conceived as the index of colonial oppression, written on the bodies of the empire’s victims. Finally, the strong, well-formed bodies of the Mozambicans – in stark contrast to the puny capitalist — communicated the good health of a citizenry whose quality of life had allegedly improved due to government-provided health care, education, and organized agricultural production. In the liberated zones of wartime Cabo Delgado, blackwood constituted another medium that could encapsulate socialist realism’s complex demands. Because of the natural density and hardness of the material, blackwood accommodated a high degree of detail and open compositions, ideal for naturalistic, multi-figured arrangements representing actions and relationships among people. Other art forms such as masks had to be positioned within an expansive complex of costumes, songs, and choreography to create a narrative. Like the political posters that would emerge in the coming years, blackwood sculptures could tell stories all on their own. In conforming their work to the aesthetic demands of socialist realism, blackwood artists in the cooperative began to conceptualize sculpture in terms of its mimetic and narrative potential to depict the human condition. Working together under party direction, they developed techniques for carving complex, naturalistic compositions that promoted narratives of struggle, communal production, and nationhood. One category of blackwood sculpture consisted of iconic depictions of rural Mozambicans, often with a subtext of suffering at the hands of colonial oppression. 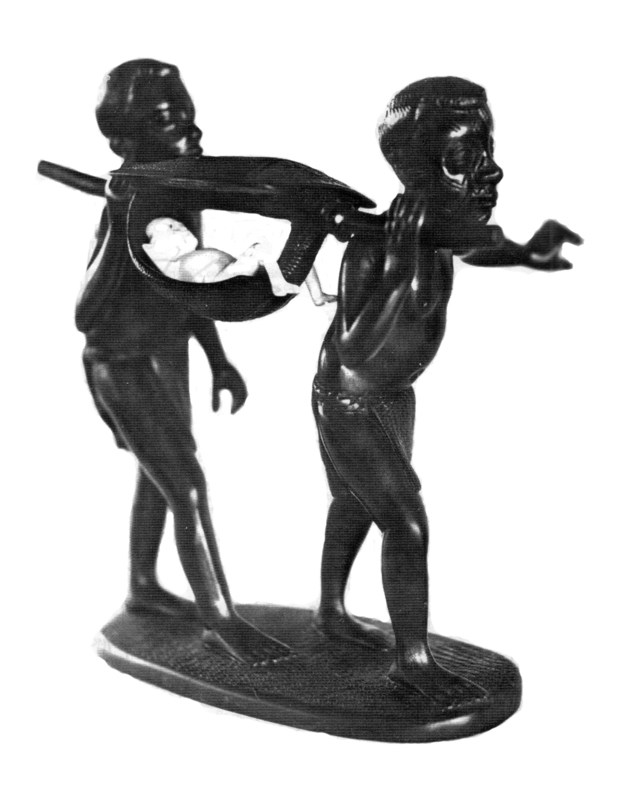 A composition dating to 1970 portrays two colonial-era Makonde men with facial tattoos carrying a Portuguese colonist in a mashila, a type of mobile hammock strung from a rod. [fig. 4] Materials and scale are employed to contrast the hard work of the bearers to the leisure of their passenger. While the Makonde men are made from blackwood and appear monumental in size, the Portuguese man, who like the European in the poster is tiny in comparison, is rendered in ivory. The casualness of his position, with both legs dangling limply from the sling, as well as the shade that protects him from the heat of the sun overhead, is juxtaposed to the stooped, straining bodies of the men who carry him. The slitted eyes of the leader convey a sense of fatigue, while the gesture of his arm, reaching outward for balance or to brush aside vegetation obstructing his path, communicate the work involved in bearing this human load. It is significant that immediately after national independence many urban Mozambican artists and graphic designers appear to have adopted ujamaa’s multifigural compositions, density, and intricacy as key stylistic elements of their own work. Mozambican urban artists Valente Malangatana, Mankeu, and Kosa frequently translated this aesthetic into two dimensions, while Maputo’s multiracial art students were trained in the collective production of public murals in the ujamaa style. In a mural at the Presidential Palace in Maputo, Malangatana depicts a bustling day in a village: he packs the space with farmers, women with water pots on their heads and children under their arms, fish, and round thatched-roof dwellings. A composition of modern and pre-colonial Mozambican warriors, workers, and villagers painted by the artists Mankeu and Kosa, also at the Presidential Palace, engages the same strategies of crowding and layering. Illustrations published in magazines immediately after independence, such as one entitled “The Agony of Imperialism,” also drew upon an aesthetic language of compact and intertwining forms. The broad adoption of these compositional strategies and – to a lesser extent – collective artistic production indicates that the ujamaa style had come to be seen as distinctively “socialist” and “Mozambican” by the mid-to-late 1970s. It is understandable that studio artists whose professional identities and individualist practices put them at risk of being labeled “bourgeois” by Party stalwarts would adopt the style for its nationalist associations of socialist praxis and collective production. In 1978, three years after independence, several blackwood sculptures were placed on display alongside works by urban studio artists in an exhibition of state art organized at the National Museum of Art in Maputo. In a review of the exhibition published by the Mozambican newsweekly Tempo, one ujamaa piece was reproduced with a caption that read, As ideias que as mãos conseguem / de uma vida que o povo tem (“The ideas that the hands obtain/ of a life that the people have.”) In this couplet, we have a succinct encapsulation of FRELIMO’s concept of the blackwood sculptors, and their art, within socialist society. It suggests that within socialist praxis, art and life are intricately entwined, and that the role of the artist is to both accurately reflect and idealize the realities of the society in which he creates. In the ujamaa style’s balanced composition of tangled human buttresses, we observe an allegory of the FRELIMO-sponsored blackwood cooperatives, and a metonym of socialist Mozambique itself. FRELIMO had adapted the colonial-era blackwood workshop to its ideological requirements, producing an aesthetic laboratory that would change the face of artistic practice in independent Mozambique. Not only had artistic creation become more collective and unified around themes cultivated by the national government, but the very concept of art, and art’s social purpose, had shifted. Makonde carvers of blackwood did not see themselves as singular individuals pursuing unique creative visions, but as collaborative producers of images whose efficacy was measured in national terms. Ultimately, they had pioneered a creative process and visual aesthetic that served as models for subsequent artists in the socialist era of independent Mozambique. In the years following independence the artisans tried to continue to develop their trade but the business declined rapidly with the drastic reduction in demand for the product. The state sector connected to culture still responsible for the organization and commercialization of this area never had much success, and with the exception of the Nandimba cooperative, well known and with products of quality, all the others were practically extinct by 1981. As opportunities in the cooperatives diminished, many Makonde blackwood sculptors began to work more intensely in the mapiko mask medium for local clients. The choices these artists made concerning style, subject matter, and means of depiction in masks were inherited from their early artistic training in blackwood. In the mid-to-late 1970s, a number of Makonde artists produced a series of masks that display a remarkable degree of cohesion in terms of style and subject. [Fig. 6] Without exception, these masks represent young African men and women with fine, symmetrical features for the most part free of tattoos and piercings. The faces are smooth and fleshy, and great attention has been paid to the curvature of the lips, the bulges of the cheekbones, and the delicate folds of the upper and lower eyelids. They look remarkably like larger scale versions of the faces in blackwood sculptures. One of these artists was Ignácio Pius Nampiko of the Imbuho Administrative Post near Mueda. Nampiko began his artistic career as a blackwood carver at the Beira Base in Nangade, and he still produced masks in this style in 2004. Under FRELIMO’s patronage, Nampiko and other blackwood sculptors cultivated several aesthetic values, notably the use of composition, scale, and other strategies of representation to create allegory and narrative; the observation and evocation of human emotion; and the use of visual models to achieve greater realism. Now carving masks, Nampiko and his colleagues approached their work from a similar perspective. Nampiko, for instance, described how he achieved a greater degree of realism and emotional vitality in his masks by visualizing well-known acquaintances, much as he might have when carving portraits of the heroes of Socialism in blackwood: a mask completed in 2001 portrays Josina Ernesto, a woman he had known in Nangade, while the mask he was finishing at the time of our interview in 2004 was modeled on a local youth in Imbuho. When explaining his aesthetic preferences Nampiko stated that he only carves masks that represent “modern” people, and this appears to be a universal characteristic among this group of sculptors. For the blackwood sculptors, masks of modernity followed the aesthetic ideals encouraged by the state in other media and were cleansed of marks of ethnic differentiation: facial tattoos, lip plugs, and chipped teeth are largely absent from the masks produced by this group of artists. As in posters and blackwood sculptures, masks with smooth skin and natural teeth had become synecdochical symbols of the broader project of national unity in the ideological context of the 1970s and 1980s. The sculptors’ emphasis on the upper teeth produced another effect: these masks are smiling. Indeed, the overall aesthetic of happiness, healthful vigor, and youth that infuses them was in line with the ideological requirements of the post-colonial era. While during the war years FRELIMO had mandated images of suffering and turmoil for propagandic purposes, the new age of socialist liberation required an art that emphasized more positive qualities. These masks – some of which were undoubtedly recognizable portraits of actual individuals living among the people – allowed the viewer to connect to the optimistic messages they communicated in a very personal and localized way. All evidence, including visits to sculptors’ workspaces, suggests that for these artists the adoption of mask sculpture was accompanied by a return to an earlier model of artistic production based on individual creation pursued in solitude. However, unlike their peers, sculptors like Nampiko had engaged in an intensive moment of collective training and collaborative aesthetic invention during the early stages of their artistic development, and could reference a shared aesthetic and technical vocabulary. FRELIMO had found it difficult to extend collectivization beyond the original liberated zones after Mozambican independence, and by 1978 the ideal had crumbled to such a degree that the government declared a countrywide campaign of “socialist emulation” to shore up support among the greater Mozambican population, many of whom expressed little interest in FRELIMO’s ideas. Abandoning the essential tenets of socialist praxis for more individualized creative paths, it seems that these Makonde sculptors were largely in step with Mozambican society around them. Aging anti-colonial warriors, they were still sensitive to governmentally instilled ideals and aesthetics, but sought greater autonomy in their daily lives from an increasingly autocratic regime. The research for this essay was a component of that completed for my doctoral dissertation on Mozambican Makonde mapiko masquerade from January to December 2004. During this time I lived primarily on the Mueda Plateau in Cabo Delgado Province but spent significant time with urban Makonde populations in Maputo, Nampula, and Pemba. I spoke with six surviving blackwood sculptors from the original FRELIMO military cooperative, some of whom remain active, in their homes and workshops. As it is difficult to determine the dates, origins, and intended audience for many blackwood pieces, I have only alluded to the small number of works reproduced in FRELIMO party publications during the 1960s and 1970s, for which these details can be more accurately determined. The Portuguese government granted the multi-national Nyassa Company (Companhia do Niassa) administrative rights over much of northern Mozambique from 1920 to 1929, at which time the state revoked the company’s charter and installed its own representatives. For a detailed history of the chartered companies, see: Leroy Vail, “Mozambique’s Chartered Companies: The Rule of the Feeble,” The Journal of African History 17:3 (1976): 389-416.  Mozambican Makondes and their Tanganyikan neighbors north of the Rovuma River both employed ebony as a carving material for utilitarian items (combs, lip plugs, and snuff containers, for example) and created figural art for non-indigenous patrons prior to this decade. With the north’s greater integration into colonial economic and governmental structures in the 1930s, however, the genre found new patrons and experienced a major upswing in production.  Edward A. Alpers, “Representation and Historical Consciousness in the Art of Modern Mozambique,” Canadian Journal of African Studies 22: 1 (1988): 82.  Even a cursory study of the great number of Mozambican Makonde helmet masks in public and private collections reveals that several dominant styles emerged over time. Elsewhere, I propose that these styles result not from a shift in methods of production, but rather from terms of Makonde artistic patronage and reception in Mozambique. On the Mueda Plateau, most Makonde masks are made on commission, with patrons dictating the subjects and appearance of the masks they purchase. To a great degree, then, mask aesthetics are determined by popular tastes rather than the individual creative visions of their authors. See: Alexander Bortolot, A Language for Change: Creativity and Power in Mozambican Masked Performance, circa 1900-2004 (PhD Diss: Columbia University, 2008): 15-40. 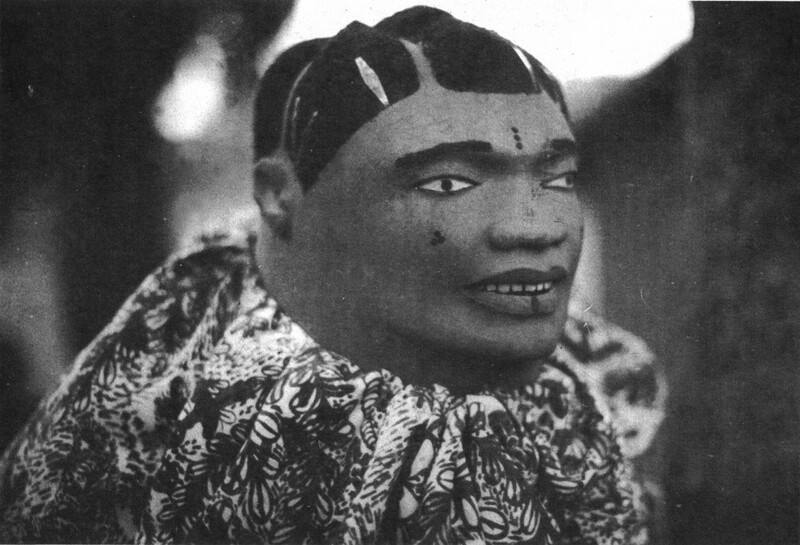  A parallel example of organized commercial carving in the 1940s and 1950s can be observed in the example of Nampyopyo Kulombanungu, who developed a genre of figural sculpture in ntene, the soft wood used for mask carving. Small carvings representing contemporary colonial life, generally brightly painted, were marketed to colonial representatives, notably the head of the Muidumbe Administrative Post on the southern edge of the Mueda Plateau. Kulombanungu, while carving himself, also permitted others to carve in the same style and came to occupy a position as a middleman, receiving orders for sculpture from his patrons and then passing them along to his cadre of carvers. For more information on Kulombanungu, see: Alexander Bortolot, A Language for Change: Creativity and Power in Mozambican Masked Performance, circa 1900-2004 (PhD Diss: Columbia University, 2008): 152-155. Also: Ricardo Teixeira Duarte, Escultura Maconde (Maputo: Núcleo Editorial e Departamento de Arqueologia e Antropologia da Universidade Eduardo Mondlane, 1987): 99-103.  It has been estimated that as many as 70,000 Makondes made the trip across the Mozambican border between 1921 and 1931. Cited in: Barry Neil-Tomlinson, “The Nyassa Chartered Company: 1891-1929,” Journal of African History 18:1 (1977): 125. A 1957 census by the British East Africa Statistical Department recorded nearly 20,000 Mozambican Makondes then in residence in Tanganyika. Cited in: Edward Alpers, “’To Seek a Better Life:’ The Implications of Migration from Mozambique to Tanganyika for Class Formation and Political Behavior,” Canadian Journal of African Studies 18: 2 (1984): 377.  See: Dias, Margot. O Fenómeno da Escultura Chamada “Moderna.” Lisbon: Junta de Investigações do Ultramar, Centro de Estudos de Anropologia Cultura 1973. Kingdon, Zachary. A Host of Devils: The history and context of the making of Makonde spirit sculpture. New York: Routledge, 2002.  “Nampula: Dar Valor Real a Cada Obra de Arte,” Tempo no. 327 (January 9, 1977): 38.  “Reunião Nacional de Cultura no. 6: Artes Plásticas,” Tempo 361 (September 4, 1977): 38.  Orlando Mendes, “Museu de Nampula: Património a Defender e Mostrar,” Tempo 517 (September 7, 1980): 49.  Guebuza and Vieira, “The Growth of a New Culture,” (1971): 10.  “Reunião Nacional de Cultura no. 6: Artes Plásticas,” Tempo 361 (September 4, 1977): 37.  Rui Nogar. “Cultura: O Que Vão Ser as Casas de Cultura,” Tempo no. 330 (January 30, 1977): 46.  This term appeared in the poem Forja do Homem Novo by Samora Machel, see: Samora Machel, “Forja do Homem Novo,” Poesia de Combate II (Maputo: Edição do Departamento de Trabalho Ideológico, 1977): 13.  Roxo Leão, “Acerca da Arte e da Cultura,” Tempo 394 (April 23, 1978): 47.  The terms of this debate resemble those that occurred at around the same time among artists associated with the African National Congress in South Africa. More research needs to be completed on the level of exchange between FRELIMO and the ANC and those associated with them on this subject.  Interview: Alexander Bortolot with Matias Ntundu, Nandimba village, Dec. 10, 2004. For a description of a post-war blackwood cooperative organized along similar lines, see: “Nampula” (1977).  FRELIMO, Dept. of Information, “Shaping the Political Line: Analysis of FRELIMO’s Political Evolution,” Mozambique Revolution 51 (April-June, 1972): 20.  “Javali-Javalismo: Teatro ao Serviço da Crítica,” Tempo 281 (November 9, 1975): 19.  It is important to heed Matthew Cullerne Brown’s assertion that socialist realism, which at any rate emerged as a term within Russian literary criticism, has no inherent visual style. Given that art itself was first considered an ideological phenomenon that served class interests, the best qualified individuals to determine visual style were not artists but political thinkers, and in the USSR Stalin himself set the visual terms through which socialist realism would be conceived. His appreciation for nineteenth century Russian academic painting coincided with his judgment that realistic, narrative compositions were best suited to communicating to the public. FRELIMO intellectuals modeled their own proposed style of socialist realism upon Stalin’s original choice, leading to a similar association of socialist realism with narrative compositions populated by idealized, naturalistic subjects. See: Matthew Cullerne Brown, Art Under Stalin (New York: Holmes and Meier, 1991): 89-92.  The USA, as a symbol of capitalism and the excesses of bourgeois individualism, was also the leader of NATO, which saw the Mozambican revolution as a proxy war in its fight against Socialist expansion and thus did not support FRELIMO and its allies. Consequently the USA, symbolized by the dollar sign, the peace sign, and Uncle Sam, was a frequent target of ridicule by FRELIMO-produced cartoons.  Samora Machel, “Intervenção no Comício Popular de Mueda (5 de Julho, 1983),” in A Nossa Força Está na Unidade, 73-98 (Maputo: Instituto Nacional do Livro e do Disco, 1983): 87.  FRELIMO’s political intelligentsia, while acknowledging their debt to Nyerere’s ideas, were also critical of its perceived failure to install class struggle against both colonial oppression and “tribal feudalism” as a structuring principle of Ujamaa. For more information on FRELIMO’s ideological differentiation from Ujamaa, see: Mark Simpson, “Foreign and Domestic Factors in the Transformation of Frelimo,” The Journal of Modern African Studies 31:2 (1993): 312-313.  Max, “A Agonia Do Imperialismo,” Tempo 292 (May 9, 1976).  Interview: Alexander Bortolot with Matias Ntundu, Nandimba village, Dec. 10, 2004.  Yusuf Adam, “Mueda, 1917-1990: Resistência, Colonialismo, Libertação e Desenvolvimento,” Arquivo: Boletim Semestrial do Arquivo Histórico de Moçambique 14 (1993): 58.  Interview: Alexander Bortolot with Ignácio Pius Nampiko, Imbuho Administrative Post, June 3, 2004.